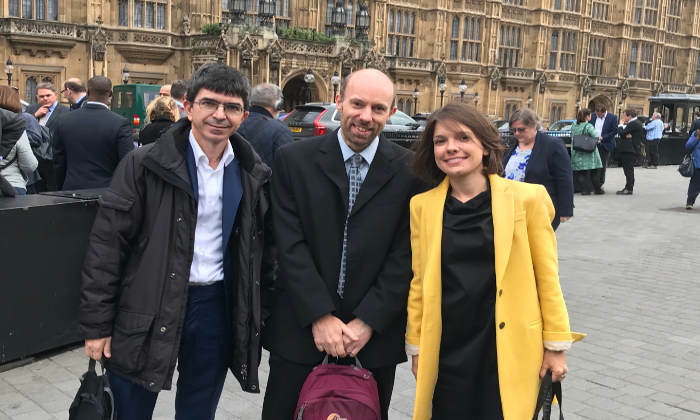 This week, Dr Barbara Ribeiro, Prof. Angelo Cangelosi and Prof. Barry Lennox travelled to the House of Lords to meet with Lord Puttnam and Lord Giddens to discuss AI and the field of Robotics. The meeting was arranged with the support of Policy@Manchester as part of their engagement programme. Barry Lennox made the case for continued support for UK industry to introduce new technologies, to help promote robotics and other innovation in the UK. Dr Ribeiro added: “This visit was a real opportunity for us to make the case for continued support from the Government, of frameworks for Responsible Research and Innovation, and their relevance for the further development of AI. The academics took the opportunity to extend an invitation to attend the SpiNNAker 1,000,000 event. This event will unveil a 1 million processor machine that has taken 10 years to construct with £15M of RCUK and EU funding, which will provide a revolutionary, low-power, research platform for neuroscientific research. Following this constructive meeting, further involvement is expected with follow ups already taking place.